This entry was posted in Reference, Uncategorized and tagged business, database, directory, education, Reference, Tools by ccld. Bookmark the permalink. When I did a search on Reference USA it said that over 300 records had email addresses. 1. Anyone know where I can find the email address in the Reference USA records? 2. Anyone know how to search for those records that just have email addresses? Unfortunately, we do not have access to that feature via our subscription to Reference USA. There is a separate subscription that allows access to email addresses. One thing you can do is limit your search results to only entries with websites. 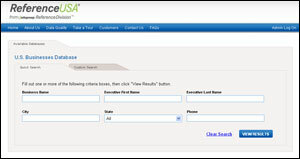 Most websites have a contact form or list an email address. To limit the search results to only those with websites, click the tab that says “custom search”. On the left hand side tool bar, expand the option for “special selects”. Click the option for “web address”. In the new box that appears, click “only companies with a web address”. Once this is done, you use the other narrowing options on the left hand side tool bar (such as company name, executives, etc.) to continue your search.